Most of us have a common tendency to upload our important data on Email services and use them when required. This practice is very handy as it allows you to access the information based upon your time-slot and adding to that, you just have to get worry about protecting a physical storage device. However, you must not forget that issues can arise any-time, and so you can always rely on a Cloud service. If you are depending on email services such as Gmail for all your important emails and data, then it is time to reconsider. Experts always recommend of opting the practice of taking backup of store data and store it safely for future use. If you are a Gmail user, then it is simple to backup all your emails and even emails in the trash and spam. You got to note that entire emails in your Gmail account are available for download via IMAP and POP. The real big advantage of using Gmail as your email client is the facility to export and back up your Gmail data without having requirement of the third-party software. Just head to Google's data download page by signing into your Gmail account. Make the selection of the data that you wish to include by choosing Gmail Labels. The two options are available; you can select the one that meets your need. Select the option "Include all of your mail" if you as a user desire to include all your emails in the exported MBOX file. 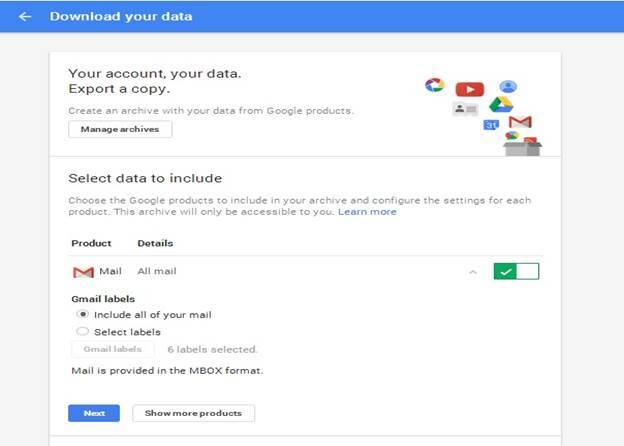 Select the option "Select labels" in order to customize the data that want to export MBOX from Gmail. 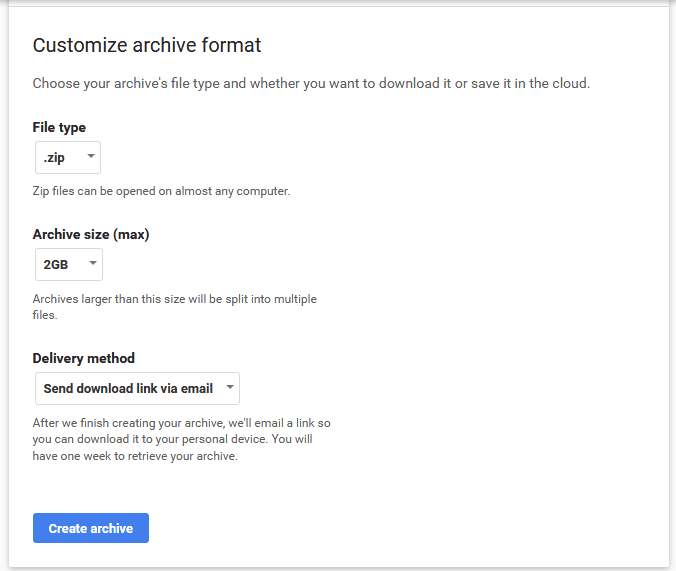 Click next after selecting "Gmail labels" and then select the required file type and delivery method in order to create a proper archive. 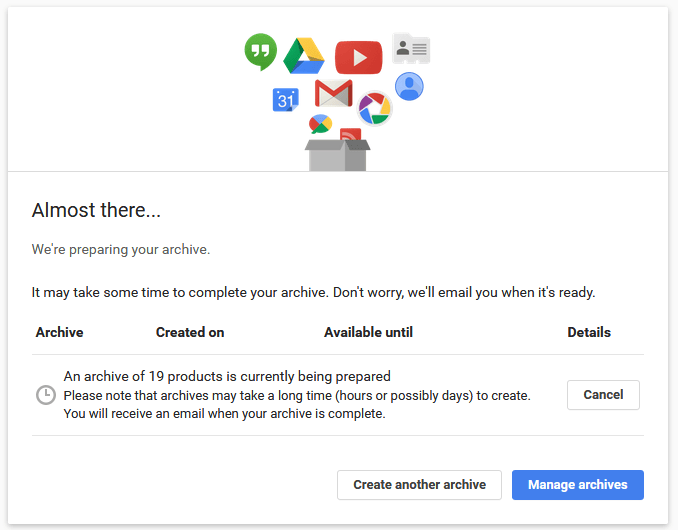 Click "Create an archive", and then look for the new Gmail entries. Based upon the current size of your mailbox, the time for the creation of archive varies and after its completion the notification providing the location of the link of the archive is send to your email address. In the email containing a link to download a .zip file that arrives, click Download archive. After extraction the exported MBOX from Gmail contains emails present in a single file if you have opted "include all mails" option or in multiple MBOX form if the "Select labels" option has been chosen. Based upon your requirement, you could also export a few messages. In fact, you could easily save individual email threads as PDF files. Just open the message you need to save as a PDF. Click the printer icon available at the top of the message display. In the menu, make a selection of your printer, select "Print to PDF" or "PDF printer" instead. (Please note that this particular step differs based upon your browser and operating system). Thus, the command opens up a familiar "Save" window, and so you can save effectively the message as a PDF file to your computer. In general, to ensure that your data will be downloaded, many of us limit these zip files to 2GB. Consequently, archives that are larger than 2GB get split into multiple zip files. Therefore, it gets important for you to make selection of the tgz or tbz format for your archive, which simultaneously increase the size limit to 50GB. Thus, you got to take care of the limit of the archive file. Apart from these, archive expires in about 7 days. After that time, you'll want to create a new archive with your most current information. Although, each archive can be downloaded 5 times, but after that, it is ideally recommended to create another archive. Also, just in case if anything goes incorrect with your archive or you're not able to make one, then you would require to create another one, and so you can fix the problem. 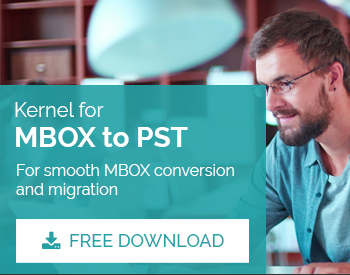 The .mbox file you acquire is well supported by most email clients and if you want to access MBOX file in Outlook then all that you require to do is perform MBOX to PST conversion with the help of a suitable MBOX to PST conversion software.